Asbury University received a B+. Washington Monthly's ranking of 18 out of 346 of Baccalaureate Colleges - Overall Rank was a major contributor to this grade. "Tiny Wilmore, KY (population 5000) is home to this Christian college of about 1300 students. The small town adds to the close knit feeling on this campus. Attending Chapel together three mornings each week also helps students bond. Asbury was recently ranked one of "America's top liberal arts schools" in The National Review College Guide, a conservative Christian guide to colleges and universities." Describe the type of student who should not attend Asbury University and explain why. Someone who wants to party (like frat parties/drinking) all the time because that's not what the culture of Asbury is about. Describe the type of student who should attend Asbury University. Why? What is a typical Asbury University student like? Describe the type of person that should attend Asbury University. What are the top 3 reasons someone should attend Asbury University? What was a typical Asbury University student like in high school? Describe the type of person that should attend Asbury University. There are two types of people who attend Asbury: the homeschool, uber-Christian ones, and the more liberal, interested in media and entertainment students. Oh, and also the horse lovers. With a commitment to academic excellence and spiritual vitality, Asbury University encourages more than 1,300 students to study, worship and serve together on a campus located 20 minutes southwest of Lexington in Wilmore, Kentucky. Primarily a four-year, multi-denominational institution, the University has been at the heart of spiritual movements throughout its history. Students come from 44 states and 14 foreign nations, and more than 80 percent of the University's students live on campus. Classes are taught by experienced scholars, 75 percent of whom hold terminal degrees in their field of study. 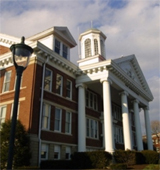 Asbury University's 14 academic departments offer more than 40 majors. The University also offers several master's degrees in education, including alternative certification programs, and a master's of social work degree. The University also has an adult degree completion program called Adult Professional Studies (APS) and Online Programs. The University provides many opportunities for student involvement both on and off campus. Internships, exchange programs, missions and community service opportunities are also available and are part of the curriculum in nearly every major. More than 20,000 living alumni of the University surround the globe, leading and serving in all 50 states and at least 80 nations. What are the top 3 things that students do for fun at Asbury University? A program that focuses on the application of mathematics to the theory, architecture, and design of computers, computational techniques, and algorithms. Includes instruction in computer theory, cybernetics, numerical analysis, algorithm development, binary structures, combinatorics, advanced statistics, and related topics. The average student pays $19,418 for tuition, fees, and other expenses, after grants and scholarships. Total stated tuition is $25,894, in-state and on-campus, before financial aid. Learn more about financial aid at http://www.asbury.edu/offices/financial-aid. Estimate the net price for you at http://tcc.noellevitz.com/(s(g0fsrcgjr03lu2duzlyuiwrr))/asbury%20university/freshman%20students. Asbury University participates in the NAIA Division II for college athletics. Want more info about Asbury University? Get free advice from education experts and Noodle community members.